Editor’s note: Erik Rannala is co-founder and managing partner of MuckerLab. Follow him on Twitter @ersf. Much has been written about the Series A crunch that is facing entrepreneurs and their investors. Those who believe the crunch is upon us contend that a significant number of seed-funded startups will not be able to raise follow-on financing. A cursory review of the data reported recently by CB Insights would seem to support the fact that the Series A crunch is a market reality. However, while the CB Insights data, which includes angel-funded new ventures, shows a significant increase in seed activity, the PwC MoneyTree data shows a more nuanced story. Looking at PwC MoneyTree’s almost 20 years of venture investment data (below), it turns out that the Series A crunch is a phenomenon that is disproportionately driven by, and will disproportionately impact, the bottom of the startup financing market: angel investors. According to PwC MoneyTree, the rate of seed investments made by venture funds (including both seed and traditional early-stage funds, but not including angel investors) has actually remained relatively consistent over the past 10+ years. In fact, the ratio of Series A to seed investment increased in 2011 and 2012 (partial-year data). Likewise with regard to the ratio of dollars going into seed and Series A rounds. In other words, the majority of the incremental capital flowing into seed deals appears to be coming primarily from angels, not venture funds. The spike in angel investments is driving the Series A crunch, not an expansion of professional seed or early-stage venture investments. For startups, at least until recently, the flood of capital has meant more opportunity to prove out product-market fit, hit some milestones and scale the business. Furthermore, the influx of capital has meant that more companies are able to raise an institutional seed or Series A round of financing, providing a better harvest for downstream venture-fund investors. But entrepreneurs in particular need to heed the wisdom of the “crunch” – raising $20K or even $200K exclusively from angels often won’t be enough to get a company to the milestones it needs to raise additional capital. Some of these companies may indeed be “orphaned,” unable to raise more capital when their angel funding is depleted. Conversely, entrepreneurs with professional investors may often be at an advantage. Their investors bring large pools of committed follow-on capital and the ability to put together financing syndicates increasingly critical to their survival. The higher likelihood of these companies raising follow-on financing is supported by the data. For downstream venture fund investors, it means better capitalized seed round and Series A candidates with more progress and traction. But for angel investors who are footing the bill for this influx of capital, it could mean a fair bit of disappointment. Analysis of the data from the Angel Investor Performance Project by the Kauffman Foundation concluded that 66 percent of angels in their dataset made back less than what they invested, and a whopping 45 percent generated no return at all. 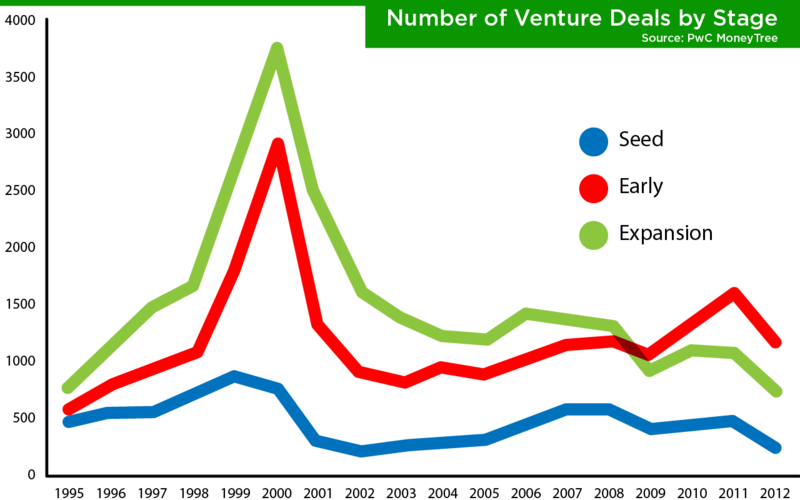 For better or worse, venture funds seem to be the big winners here. Seed and Series A venture funds will have more companies to choose from, and many of these companies will have made more progress toward product-market fit than they otherwise would have. In addition, they would have side-stepped potential risk with the angel funding they raised prior to seeking institutional venture capital.